I tried this one larger than my usual 9 x 12 size. The increased size made it more difficult to finish in my normal time frame and also made the drawing tougher, because it's hard to hide any drawing errors. Some things worked and some didn't, but it's always fun. 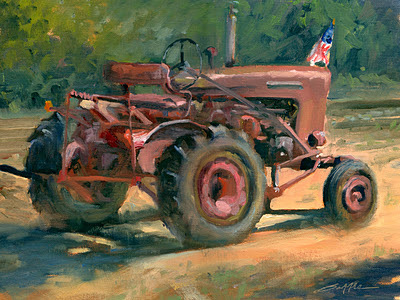 I don't need any extra reasons to paint a tractor, but I loved the little flag on the front. A real beauty of a workhorse, Randy. Tractors and trains are sure some of your greatest strengths. It is great to see you painting a larger size. You are right about drawing becoming more important as size increases but it looks like you nailed it. Reason #214: Why plein air painting is tough.